Mycoplasma testing is the process of identifying contamination which can have adverse effects on cell line growth and characteristics. Such Contamination may occur as a result of contact with other previously infected cultures and can also be transferred by the cell culture technician or through the use of contaminated reagents. Mycoplasma testing and testing procedures minimizes the risk of contamination from these sources. Globally increasing R&D activities amongst bio tech and pharmaceutical companies is expected to remain key growth driver during the period of study. This report identifies the mycoplasma testing market size in for the year 2015-2017, and forecast of the same for year 2022. 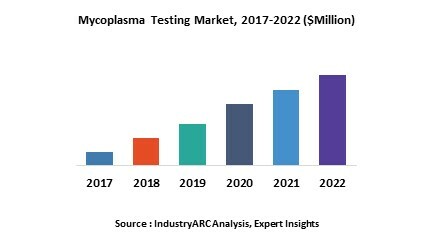 It also highlights the potential growth opportunities in the coming years, while also reviewing the market drivers, restraints, growth indicators, challenges, market dynamics, competitive landscape, and other key aspects with respect to mycoplasma testing market. Geographically North America dominated the mycoplasma testing market owing to presence of global bio tech companies and pharmaceutical players and higher investment into R& activities in the region. North America was followed by Europe and Asia-Pacific as the second and third largest markets for mycoplasma testing. However Asia-Pacific is expected to remain the fastest growing market during the period of study driven by economic developments, increasing presence of bio tech companies and growing government funding to support new product developments are the key factors driving the growth of market in developing regions. 16.7. Charles River Laboratories International, Inc.
16.8. Bionique Testing Laboratories, Inc.
16.9. Biological Industries Israel Beit Haemek Ltd.
"Table 40: Mycoplasma Testing Market By Technology, Revenue & Volume,By Direct Assay , 2018-2023 ($)"